THERE IS NO DAMAGE WAIVER ON TRAILERS. THE CUSTOMER IS TOTALLY RESPONSIBLE FOR THE TRAILER AS WELL AS FOR FIXING FLAT TIRES. 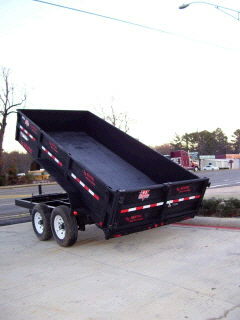 * Please call us for any questions on our trailer dump 14 foot 6.22 cu yds rentals in White Oak, Longview, Gilmer, Gladewater, Big Sandy, Kilgore, and all of East Texas.